The first time I tasted gnocchi, I was pleasantly surprised at its rich potato flavors and dumpling-like features. After receiving a recipe from a friend I made during my first year of college, I began to tweak and try different measurements and methods. I experimented in my own kitchen and after sampling many variations at restaurants, I fell in love with using sweet potato to add a subtle layer of sweetness. 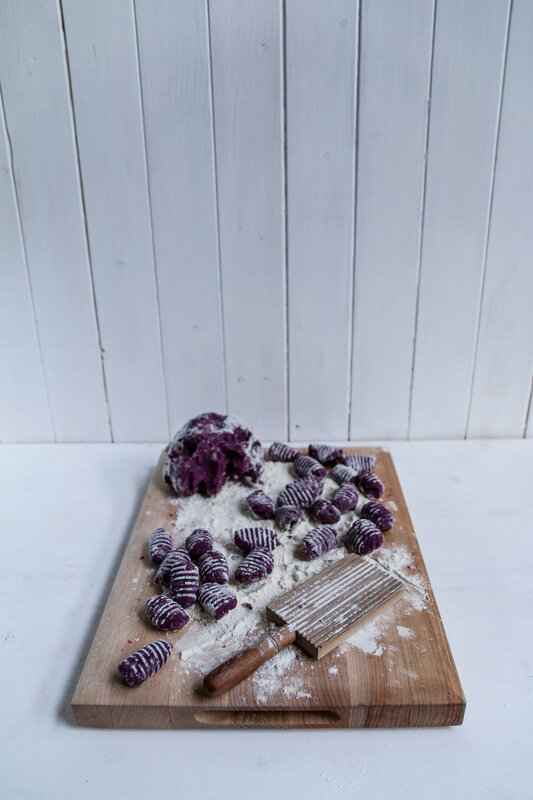 After having mostly used sweet potatoes with an orange hue while testing this take on a recipe that normally features russet potatoes only, I stumbled upon the idea of making gnocchi with purple sweet potatoes when shopping for vegetables one afternoon. I spotted the violet colored spheres all toppled on top of another, covered in dirt and tucked next to the more commonly used orange version, and the idea for this recipe was born. Interestingly, while testing gnocchi made with purple sweet potatoes, I noticed that there were a few differences in texture that led me to make different tweaks to the recipe than when I made it with orange sweet potatoes. Adding an egg to the dough is simply a must, otherwise the dough will disintegrate once it hits the water (something I had not encountered with orange sweet potatoes). I also called for half the dough to consist of a russet potato, as this helps to keep the pasta from being too dense. While mixing the flour into the dough, be careful not to knead the dough too much, as that could cause the pasta to come out a bit rubbery in texture, and add only enough flour until the dough is dry to the touch. I always like to tear a piece off of the dough and toss it in the boiling water as my "test piece", as if there isn't enough flour it can disintegrate. If the "test piece" holds together and has a desirable texture, go ahead and make the whole batch! If it falls apart in the water, you may need to add more flour and try again. I personally like to make my gnocchi pieces on the extra large side! I've had gnocchi that are a third of the size of the ones I make at home, so size is definitely a preference in my opinion! I like to use an arricciagnocchi, or a wooden gnocchi board, to form the balls into uniform, ridged pieces (you can also use the tongs of a fork). This is also up to preference, as gnocchi can also be made by rolling the dough into logs and cutting off one-inch pieces. Another twist I like to add to my homemade gnocchi - toasting the pasta in butter or olive oil to create a browned crust on the bottom. This is a required step in my house, as I think it gives the gnocchi an amazing texture and a caramelized flavor, but yet again I must admit this is preference as well. You can most definitely have your gnocchi without this step, but I do hope you'll try it! I always use my trusty cast iron pan for this step as it creates the most beautiful browning. Please note that this step won't work on a stainless steel lined pan as the pasta will stick and burn. I've used enameled cast iron and nonstick with decent results, but I will say that cast iron does the best job. I simply cannot get over that vibrant violet hue! This is truly such a visually stunning and scrumptious tasting pasta dish. The flavors are just slightly sweet, rich, and comforting. I think arugula adds a fresh texture and an earthy, peppery flavor while complimenting the classic flavors of butter and shaved parmigiano quite well. I hope this twist on a classic Italian recipe inspires you to make homemade gnocchi in your kitchen as well! One large purple sweet potato, or enough to measure 1 cup when cooked and mashed. One medium russet potato, or enough to measure 3/4 cup when cooked and mashed. Place the purple sweet potato and russet potato on a baking sheet and roast in the hot oven until soft, about 30 minutes. Remove the potatoes from the oven, allow to cool, and slice lengthwise. Scoop out the soft potato discard the skins. Mash the sweet potato and russet potato separately, then measure out 1 cup mashed sweet potato and 3/4 cup mashed russet potato into a mixing bowl. Discard (or save for later!) any remaining mashed potato. Pour a beaten egg into the mixing bowl and stir to combine with the mashed potatoes. Gradually add the all purpose flour, starting with 1/2 cup, and add more while very lightly kneading until the dough is dry to the touch and not sticky. From the dough, form 1 inch balls (they can be smaller or larger than this if you prefer!) and roll off a gnocchi board or the tins of a fork. Alternatively, divide the dough into four pieces and roll each piece into a log about an inch wide, and cut into pieces an inch in length (this method won't create those classic gnocchi rivets but will taste just as lovely, and take up half the time). Bring a pot of salted water to a boil. Drop in gnocchi, give the water a swirl to make sure none are sticking together or are stuck onto the bottom of the pot, and cook for 3 to 5 minutes or until the gnocchi rise to the surface. Heat a cast iron pan over medium-low heat and add the unsalted butter. When the butter has melted, spoon the cooked gnocchi into the pan. Allow the gnocchi to sizzle for about two minutes, or until the underside of the pasta is browned and slightly crispy and the butter is golden. Remove the gnocchi from the pan and serve drizzled with any remaining melted butter, a handful of arugula, flakey sea salt and fresh cracked pepper, and a plentitude of shaved parmigiano-reggiano.